The exquisitely designed 2015 Toyota Avalon comes stocked with a helping of new and updated features across the lineup this year. Fresh advanced technologies have found their way onto select models and brand-new paint options have been added to the color palette. An all-new limited production model: the XLE Touring Sport Edition, will also be available for buyers who are looking for enhanced styling and additional driving capabilities. Check out our 2015 Toyota Avalon review below to discover more info about this model and other details. If a one-of-a-kind 2015 Toyota Avalon in Evansville is what you're looking for, then the new XLE Touring Sport Edition is for you. Sporting black paint, Quadrabeam headlights, 18-inch black alloy wheels and LED daytime running lamps, the upscale model is beautifully designed. Inside, the exceptional styling continues with leather-trimmed heated front seats, an eight-way adjustable driver's seat, a dark blue dash trim, Tour Sport Edition logos on the floor mats and aluminum scuff plat doorsills. 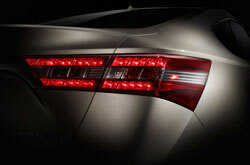 Across the remainder of the Avalon lineup, updated technologies reign supreme. Second-generation Entune audio is equipped on all models, as well as paddle shifters with three modes: Eco, Normal and Sport. The XLE Touring and Hybrid XLE Touring also receive blind-spot monitoring and rear-cross traffic alert as a part of their safety offerings. Additionally, two paint color options: Cosmic Gray Mica and Celestial Silver Metallic, have now been added to the roster. When it comes to power offerings, the 2015 Toyota Avalon in Evansville provides one option: a 3.5L DOHC V-6 engine. With the ability to produce 268 horsepower and 248 lb.-ft. of torque, the variant produces phenomenal performance. A six-speed automatic transmission also supports the engine, helping to achieve an EPA-estimated 24 mpg combined, 21 city and 31 highway. To acquire more details about the Avalon and its abilities, read our 2015 Toyota Avalon review for further information. In a multitude key areas, the 2015 Avalon surpasses contending vehicles like the 2015 Hyundai Azera, Acura TL, Chrysler 300, Ford Taurus and the Buick LaCrosse. The Avalon's got several noteworthy characteristics, including its convenient onboard technologies and exquisite styling. When comparing its price to the aforementioned vehicles you will surely see that Evansville Toyota customers select it because it's a fabulous value. Take a peek at our Avalon Facts list; look just below this text for bullets. We've taken the time to create reviews about vehicles like the 2015 Toyota Avalon because we know how important it is to your car search. It's difficult to find hard facts about a large array of cars in one spot. That's why it's OUR responsibility to offer reviews from well-versed auto critics, so you have access to these tools on one site. 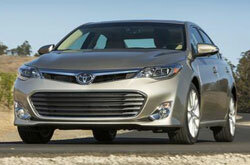 This Toyota review contains accurate information about the Avalon and it's specifications, safety features and more. 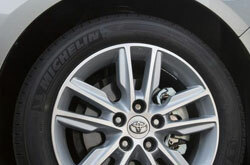 Please visit our Toyota review and compare gallery if you feel the Avalon is not a good choice for you; there you&ll learn about Kenny Kent Toyota's entire lineup.